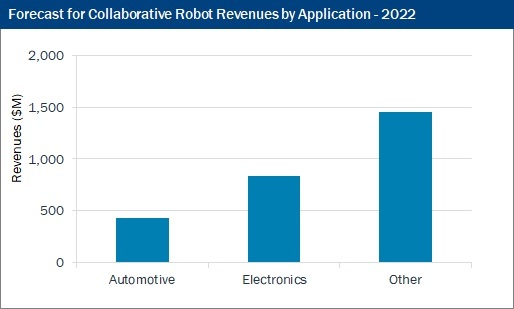 The nascent collaborative robot market is set to grow by more than 60 percent this year according to an upcoming research report. from Interact Analysis. The industry was worth less than $400m last year but is set to grow to nearly $600m in 2018. 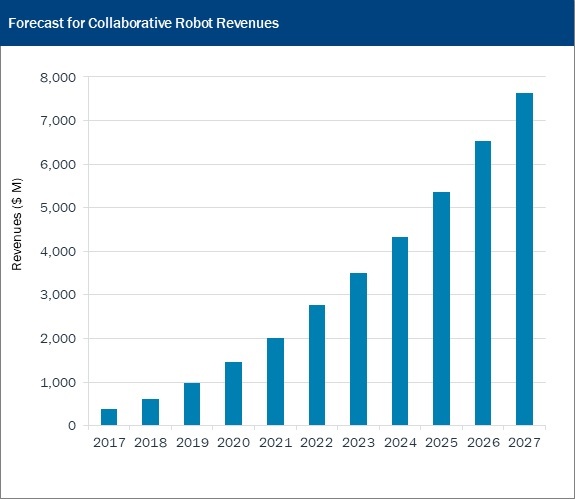 Furthermore, growth is forecast to accelerate due to the wider availability of collaborative robots from mainstream industrial robot vendors, the greater awareness at SMEs, and the wider adoption by major OEMs. By 2027, we forecast that revenues will reach $7.5bn and account for 29 percent of the industrial robot market. Many of the drivers of demand for collaborative robots are the same as those for other automation products: a lack of available workers, increasing labor costs, shortening of product cycles and higher product mixes. However other specific drivers will support demand for collaborative robots, such as: the need for greater automation flexibility and requirement to save floorspace and eliminate safety fences. Revenues are forecast to grow at an annual pace of more than 60 percent over the next two years, and at a CAGR of more than 35 percent until 2027. Until now, uptake of collaborative robots has been extremely fragmented. The largest customer base has been small and medium sized enterprises who have been unable to use industrial robots due to their large size and cost; but instead can incrementally add collaborative robots to automate certain processes. We expect that SMEs will continue to drive short-term growth. Both through new SMEs adopting collaborative robots due to increased awareness, and existing customers choosing to further automate and purchase additional cobots. The lack of skilled and available workers will help to accelerate this trend. Furthermore, we expect adoption by more major OEMs to considerably accelerate in the next five years, particularly now that collaborative robots are available from major, well-known, industrial robot vendors. As previously mentioned, demand for collaborative robots has been very diverse and fragmented to date. As such the types of industry and applications adopting collaborative robots has been equally diverse. This is likely to continue; however, we predict that this will evolve in a similar way to industrial robots, with electronics and automotive being the two largest vertical applications. These applications are heavy users of industrial robots and both are already adopting collaborative robots to further augment and increase automation at their production facilities. The Electronics sector has perhaps some of the fastest design cycles and product variability and hence requires the greatest automation flexibility which lends itself well to using collaborative robots. Despite the high growth of the industry currently, and that anticipated for the future, all is not rosy for the suppliers of collaborative robots. The recent exit and winding up of cobot pioneer, Rethink Robotics highlights the challenges that manufacturers currently face. The market is still relatively small, yet an increasingly large number of vendors are active. Coupled with this is the challenge of fragmented and diverse customer demand – we estimate that customers average 1 to 10 cobots per facility (tending more towards the lower end). This infers average sales per automation project of just $30,000-350,000 (again towards the lower end) and as such due to infancy of the industry, considerable effort and investment is required to build up a sizeable business. Of course, most cobot manufacturers are not selling directly to end customers, instead relying upon a network of distributors and integrators; yet the fragmented demand will of course still place huge demands on the manufacturers to support. Although Universal Robots still dominates this industry – we found that it held a 46 percent market share last year – new suppliers continue to emerge. Most of these new entrants tend to either be Chinese and Taiwanese collaborative robot vendors (which have often spun out of other ventures) or large, well-established industrial robot vendors. Both sets of companies are likely to make the industry much more competitive for differing reasons, and it is inevitable that weaker suppliers will be unable to compete. The report identified over 30 vendors with more than 90 collaborative robot products available on the market currently – quite a number given the small size of the market. Interact Analysis is an international provider of market research for the Intelligent Automation sector and has offices across the world, including the US, UK and China. Our team of respected industry analysts delivers high levels of market intelligence in the field of Intelligent Automation. Our analysts have an average 15 years industry experience and our trusted leadership team has close to 100 years’ experience in technology-based research, and we are renowned for providing data and analysis of the highest quality.